Bower Spinach (Tetragonia implexicoma) and Sea Spinach (Tetragonia decumbens) are local relatives of the well known Warrigal Greens or New Zealand Spinach (Tetragonia tetragonoides) that restaurants love. They are all related to the Ice Plants and Pigface that I’ve covered before, being in the family Aizoaceae. The greatest joy of both species as a bushfood is that they’re with us all year round, so we may forage them at any time. Both species are easy to identify, sprawling succulents (see below). 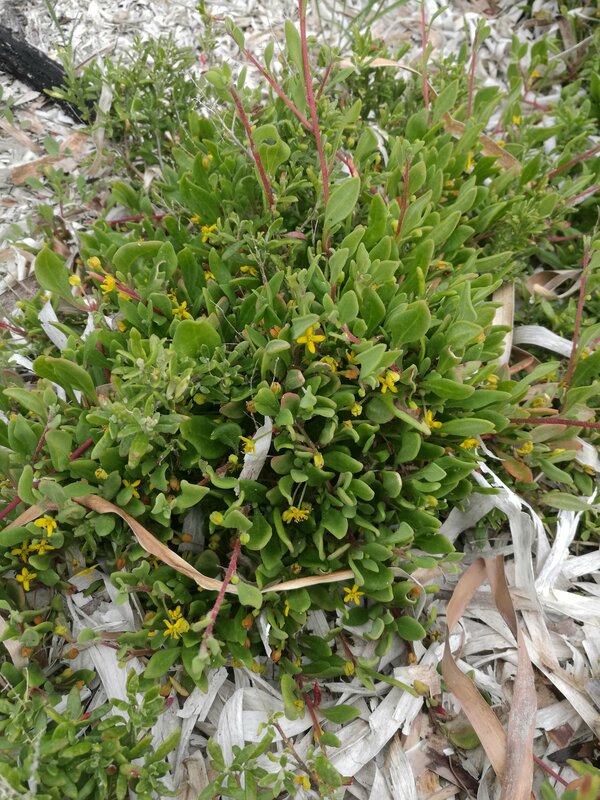 Bower Spinach likes cooler, moister soils under trees near beaches and in the Mallee. Sea Spinach prefers more open places such as on dunes. 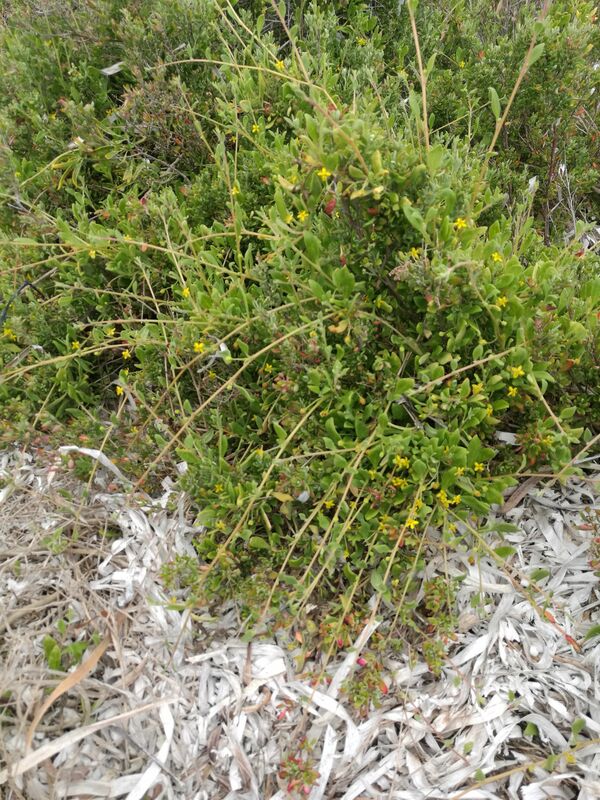 They are vigorous, sprawling, scrambling herbs, frequently with stems that are metres long that can cover rocks and shrubs. Both usually establish themselves near or under trees and shrubs from which birds drop or poo out undigested seeds that are then provided with fertilizer and a little moisture by the poo itself. Growing under trees and bushes, Bower Spinach forms the bowers from which it gets its common name. Sea Spinach tends to form tighter clumps as it is exposed to the elements to a greater degree than Bower Spinach. Both have reddish stems when young that get darker and browner with age. They frequently measure in the metres, lengthwise. Bower Spinach stems become woody as they get older. The leaves are green, thick and succulent and covered with little bubbles of salty water. 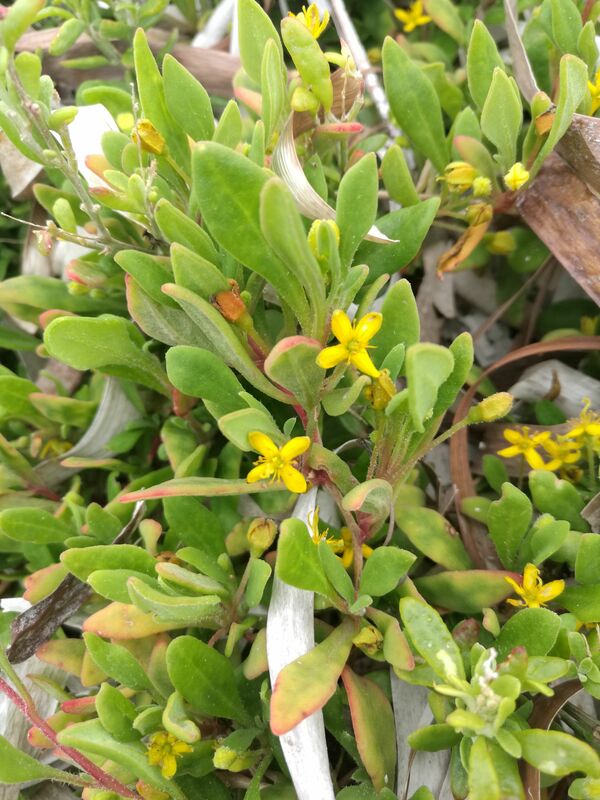 The flowers are yellow and have 4 petals, though there are very similar plants with 5 on our local dunes that can be used as bushfood too. The best way to differentiate implexicoma from decumbens is by the flowers – with implexicoma, the flowers are single while with decumbens, they are in groups of 3 to 5. Use the fresh leaves and stems as a salty, crunchy addition to salads or steam or boil them as you would any leafy greens. If you boil them, a change of water may be necessary due to their high salt content. The berries may be eaten too but are better before they go hard. They can be used to make a red dye too. Some say that they are better than Warrigal Greens because of their lower level of Oxalic acid. I’ve never measured and compared that compound in them, but it sounds like someone has!